Persons with difficulty hearing (deaf) was 2.2% of the CNMI population in 2017. The deaf percentage was higher in Rota (3.9%) than in Saipan (2.1%) and in Tinian (1.8%). The deaf percentage was highest in District 2 (2.7%) and lowest in District 4 (1.6%). Persons with difficulty seeing (blind) was 2.3% of the CNMI’s population in 2017. The blind percentage was higher in Rota (5.6%) than in Tinian (4.5%) and in Saipan (2.1%). The blind percentage was highest in District 5 (4.0%) and lowest in District 4. Persons with a physical, mental, or emotional condition causing serious difficulty concentrating, remembering, or making decisions was 1.5% of the CNMI’s population in 2017. The percentage of population with a physical, mental, or emotional condition causing serious difficulty concentrating, remembering, or making decisions was higher in Rota (4.0%) than in Saipan (1.4%) and in Tinian (1.1%). The percentage of population with a physical, mental, or emotional condition causing serious difficulty concentrating, remembering, or making decisions was highest in District 5 (3.3%) and lowest in District 2 and 3 (both 0.9%). Persons with difficulty climbing stairs was 2.6% of the CNMI’s population in 2017. The persons with difficulty climbing stairs percentage was higher in Rota (6.0%) than in Saipan (2.5%) and in Tinian (1.5%). The persons with difficulty climbing stairs percentage was highest in District 5 (5.1%) and lowest in District 3 (1.2%). Persons with difficulty bathing or dressing was 1.2% of the CNMI’s population in 2017. The persons with difficulty bathing or dressing percentage was relatively higher in Rota (1.4%) than in Saipan (1.3%) and in Tinian (0.2%). The persons with difficulty bathing or dressing percentage was highest in District 5 (2.5%) and lowest in District 2 (0.3%). Persons with difficulty doing errands was 1.7% of the CNMI’s population in 2017. The persons with difficulty doing errands percentage was relatively higher in Rota (2.2%) than in Saipan (1.7%) and in Tinian (1.0%). The persons with difficulty doing errands percentage was highest in District 5 (4.1%) and lowest in District 2 (0.3%). LFS 2017 Table P14.1 Deaf by Island and by District: CNMI 2017 Fourth Qtr. LFS 2017 Table P14.2 Blind by Island and by District: CNMI 2017 Fourth Qtr. LFS 2017 Table P14.3 Physical, Mental, or Emotional Condition by Island and by District: CNMI 2017 Fourth Qtr. LFS 2017 Table P14.4 Difficulty Climbing Stairs by Island and by District: CNMI 2017 Fourth Qtr. 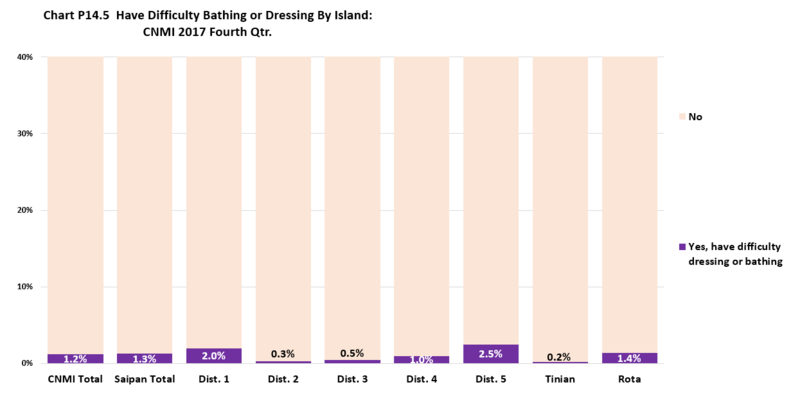 LFS 2017 Table P14.5 Difficulty Bathing or Dressing by Island and by District: CNMI 2017 Fourth Qtr. LFS 2017 Table P14.6 Difficulty Doing Erands by Island and by District: CNMI 2017 Fourth Qtr.